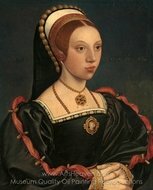 Hans Holbein the Younger was a German artist and printmaker who worked in a Northern Renaissance style. 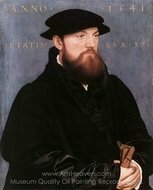 He is best known for his numerous portraits and his woodcut series of the Dance of Death. 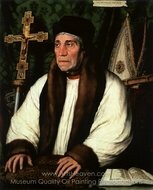 Holbein was born in Augsburg, Bavaria and learnt painting from his father Hans Holbein the Elder. 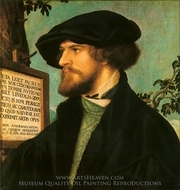 Later he went with his brother Ambrosius Holbein to Basel where he met many scholars, among them the Dutch humanist Erasmus. 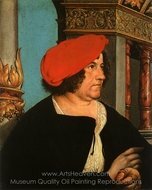 Holbein was asked by Erasmus to illustrate his satires. 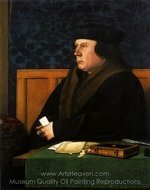 He also illustrated other books, and contributed to Martin Luther's translation of the Bible. Like his father, he designed stained glass windows and painted portraits. 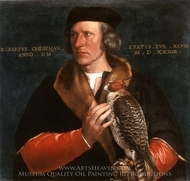 The Reformation made it difficult for Holbein to support himself as an artist in Basel, and he set out for London in 1526. 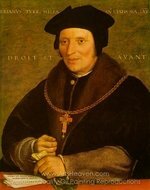 Erasmus furnished him with a letter of introduction addressed to the English statesman and author Sir Thomas More. 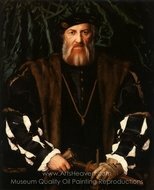 Holbein painted many portraits at the court of Henry VIII. 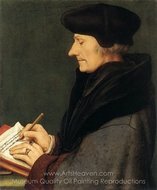 While there he designed state robes for the king. 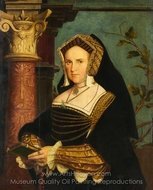 He also designed many of the extravagant monuments and decorations for the coronation of Henry's second wife, Anne Boleyn, in the summer of 1533. 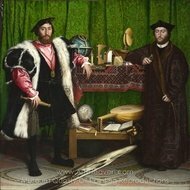 Holbein always made highly detailed pencil drawings of his portrait subjects, often supplemented with ink and coloured chalk. 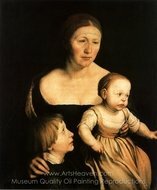 The drawings emphasize facial detail and usually did not include the hands; clothing was only indicated schematically. 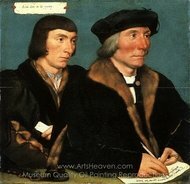 The outlines of these drawings were then transferred onto the support for the final painting using tiny holes in the paper through which powdered charcoal was transmitted; in later years Holbein used a kind of carbon paper. 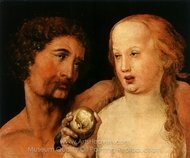 The final paintings thus had the same scale as the original drawings. Although the drawings were made as studies for paintings, they stand on their own as independent, finely wrought works of art.